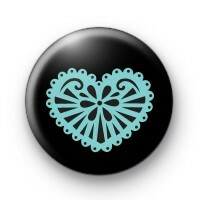 This is a black 25mm (1inch) pin badge with a light blue heart in a lace pattern. It is a simple badge but quite pretty and omantic too. Perfect for Valentines Day or as Wedding Day Favours. We all know that the heart is the recognised symbol of love so it is ideal for any romantic situation. Our badges are all handmade with love in the UK.